Innovative Store Displays should be at the top of every product-selling brands 2016 marketing plans. Here is a fantastic example by Americas Pop Gourmet Popcorn. The 2013 Seattle born company are now expanding in Asia. Here is their store-window in Hong Kong showing an incredibly innovative pop-corn encompassed dress. Catch the eye. This is a great way to creatively catch the eye of a potential consumer. 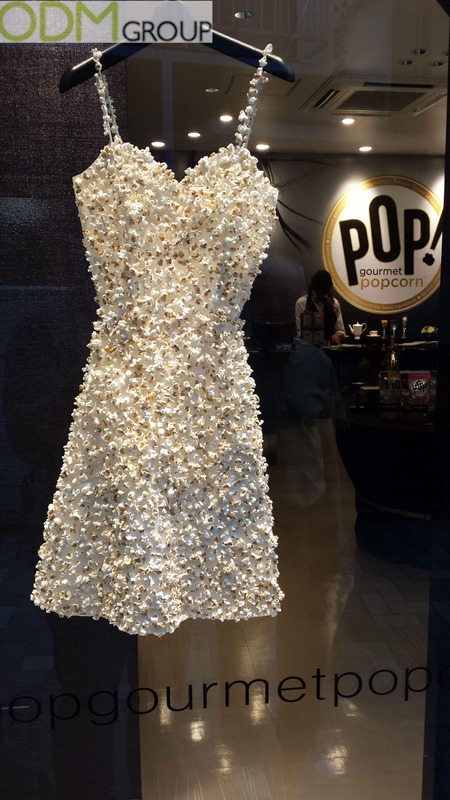 This popcorn dress can be seen as a great tool to lure customers in and encourage potential sales. Increase Brand Awareness. This is a great device to produce some positive word-of-mouth whilst gaining some traction on social media websites. The perfect illustration of the power of the wow-factor in marketing campaigns. Aid with Brand Reputation. As a new start-up this can be a brilliant way to gain a reputation that can aid with future acts and already have a positive mantra about the firm. Help Stand out. In store displays offer a great platform for brands to standout and differentiate themselves from their competitors. Here at ODM, we have significant experience in product design, product sourcing and product manufacturing. We can help you utilise your 2016 marketing budget in an effective manner. Feel free to contact us to learn more about promotional products. Or let us assist you in coming up with some new and innovative ways to promote your brand. If you’re interested in a gift with purchase, or a POS display we have comprehensive and ever-expanding portals dedicated to this on our website.